Zarautz Surf House - San Sebastian, Guipuzcoa Guests overall rating: ☆☆☆☆☆ 0 based on 0 reviews. Where else in the world are your primary concerns trying not to get too much sun and the temperature of the beer (we promise its cold!)? Where each and every day is a cycle of eating, surfing, and drinking, and the nights are spent partying, chatting and exploring? Where else can you spend your nights in the thumping nightclubs of San Sebastian, but wake up in nature surrounded by verdant hills, rustling leaves, and twittering birds? San Sebastian is one of those places that’s been touched by magic. That’s why we open the Surf House’s doors to surfers of all levels and travelers from far and wide, to share this stunning place with the world! Stay at a beautiful house in the heart of Basque Country and start your day with a delicious home-cooked breakfast before our surf instructors take you to a local beach break. If you’re a beginner they’ll get you standing in no time, and if you’re more experienced our guides will show you where to get the best waves. After you’ve surfed to your heart’s content it’s back to the Surf House for lunch followed by another surf, a local activity…or maybe the first beer of the day! Basque Country has a bunch of activities, from horseback riding and paragliding for the adrenaline junkie to pintxo tours through the Michelin – starred streets of San Sebastian for the foodies. Whatever happens, it will surely end in a massive party with our newfound friends hopping from one bar to another Spanish-style or dancing until the sun comes up over La Concha beach. Good thing surfing is the perfect hangover cure, so we can cure our spinning heads every morning and do it all again. Your meals are prepared, your beers are chilled, your beds are made for your arrival and your party nights are pre-organised. What a treat! 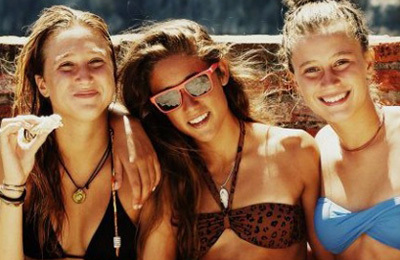 And the new friends you’ll make at our San Sebastian Roaming Surf Camp are some of the best folk around. Open-minded international travelers gather from all over the world for this trip, so there’ll be many different languages to learn and stories to hear over a beer or ten. It is a 3 story Spanish Surf Hostel hidden in the lush green surrounds of the Basque hills. It is dorm style accommodation but there are private rooms available upon request. There are 3 bedrooms, 3 bathrooms and multiple lounge communal areas which includes a bar (unlimited beer, sangria, cider available for €10 a day), a skate ramp and table tennis. It also has free wifi. This is a guide itinerary, but not like a school camp itinerary – quite the contrary. This will give you an idea of what a day might look like for you at San Sebastian Surf Camp. There’s always something for you to do, but it’s your holiday so feel free to lay on the beach, have a beer or go on an adventure with your new campmates instead. Wake up to a home cooked breakfast down in our chill out area and exchange stories from last night’s antics, read the surf report and get excited to head out surfing. Jump in our surf bus and enjoy the ride down through the national park to the beach, grab your board and either scout out the best banks on the beach or head into your lesson with one of our surf instructors. When you’re all surfed out, we’ll either have lunch in the sunshine at the beach together or head back up to the house for a hot lunch and a cold sangria. If you’re feeling bendy, join a yoga class on our yoga deck, you could head out hiking, go into town and explore, join in on a Spanish Class, head back down to the beach for another surf or just relax! In the afternoon you will most likely find yourself hanging out at the house watching the sun go down over a few drinks and sharing stories or becoming lord of the ping pong table. If you’re the sensible type you can get in a good night’s sleep and be up bright and early for sunrise yoga and breathtaking views out over the valley. If some more drinks, music and exploring sound more like you, then either join us on a pintxos tour in Zarautz or San Sebastian, a trip to a traditional Basque cider house or maybe even one of the many festivals that may be on during your stay. Visiting the many festivals that dot the region in summer. As far as surf goes, well we’re only a hop skip and a jump away from the finest surf beaches in Europe. And if National Geographic says we’re located in one of the World’s Top 20 Surf Towns, well who are we to dispute it! The Surf House is located in the picturesque town of Aia, just 20 minutes from San Sebastian. We offer pickup from San Pelaio Train/Bus Station Zarautz for an extra price. It’s super easy to get to San Pelaio Station at Zarautz. You want to fly to either Bilbao, or Biarritz. Check out Ryanair, Easyjet and Vueling for cheap deal, there’s always plenty of cheap deals. Buses leave hourly from Bilbao Airport to Zarautz (San Pelaio bus station). Jump on your pre-arranged pickup from there! Or you can catch the Euskotren to San Pelaio Station in Zarautz and as per our pre-arrangement we’ll pick you up from there! The best way to get to Surf Camp from Biarritz International Airport take a French SNCF train to Hendaye, change to the nearby Euskotren station (located just outside the SNCF station) and take the Euskotren to Zarautz pick up point, San Pelaio, Zarautz. Each train ride is between 30-40 minutes, with the total train trip costing less than €10. A coach service also exists between Biarritz airport and the Hendaye train station, via Saint-Jean-De-Luz (change buses there). The coach ride is less than one hour and costs about €4. The best way to get to camp from San Sebastian airport is to take bus e21 or e23 bus from the airport to San Sebastian which runs about every 30 minutes Head to San Pelaio Train station via the Euskotren located across the road from Amara station and make sure you let us know when to come and collect you from Zarautz! RENFE TRAIN – The train station in the centre of San Sebastián the “Estación del Norte”, offers connections to numerous Spanish cities including Madrid and Barcelona, and to international destinations such as Paris and Lisbon. if you arrive by RENFE Train make your way to the EUSKOTREN to make your way to San Pelaio Station for pre-arranged pickup from there. EUSKO TREN – There is also an underground railway, the Metro Donostialdea, a train connection with Bilbao and cities along the Basque Coast, such as Zarautz. The service also links it to Hendaye (France), the SNCF, french rail service, and with Lasarte passing through Donostia. You can catch this train to San Sebastian and Zarautz from Bilbao and from Hendaye which is the last stop on the SNCF train in France. Head to the San Pelaio Station (closer to camp) for your arranged pickup. If you arrive by bus in San Sebastian you can either make your way to San Pelaio Train station, Zarautz for collection at any time. To get to San Pelaio Train station in Zarautz simply walk across the road from the bus station to the EUSKOTREN and jump on a train in the direction of Bilbao. If you arrive by bus in Zarautz, we will collect you from the Bus station. Hopefully you’ve pre-arranged a pickup so we can be prepared. Plus check out our 7 and 10 night special packages, with freebies and inclusions up to your eye-balls, you’ll leave us an absolute pro!